A portion of every sale of Bear Gold whipped honey is donated to the local animal shelter. 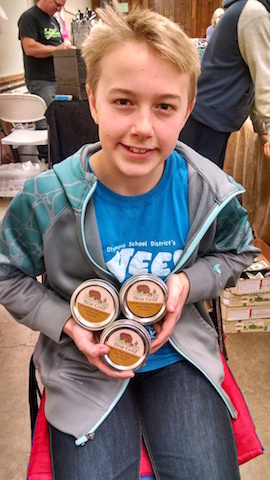 For the past two years, Satchel Sogn has been running his own business called Bear Gold. He churns honey into a velvety spread known as whipped or spun honey. It’s a creamy delight, but I’ll tell you about that in a minute. Satchel’s learning curve has been steep. He’s realized the importance of reinvesting profits and hiring help and has discovered ways to streamline operations. His business savvy continues to grow by leaps and bounds. Satchel also attends school full time. By the way, Satchel is 12 and attends Marshall Middle School. When not in school, he’s up to his elbows in transforming honey. 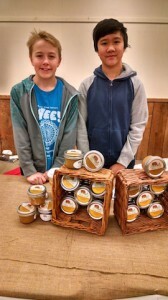 Satchel Sogn (left) is joined by lifelong friend, Henry Tran, to sell Bear Gold whipped honey. Satchel became curious about whipped honey after tasting it on a family trip. He wondered what made it different from regular honey. Using logic, Satchel took some honey and whipped it in a mixer. 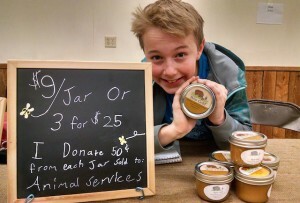 When this did not produce the desired results, he and his mom, Kristy Sogn, researched recipes and realized they needed a jar of whipped honey to use as a starter, much like the process for making sourdough bread. Regular honey is whipped with a portion of already-whipped honey. It is important to keep out added air. Then it’s sealed in jars to set. The large, broken down honey crystals now form smaller crystals, which create lusciously creamy honey. Satchel launched his whipped honey at the Youth Entrepreneur Exposition in 2014 at Avanti High School. The event offered young students the chance to present and market their goods and services to the community. It also let them interact with each other. The first year there were twelve vendors. In 2015, the number doubled and Kristy, who was instrumental in creating the event, expects the 2016 numbers to double again. These industrious young business owners gain real world experience in marketing their wares, talking to customers, managing their finances and exploring ideas. Mentors from the business community acted as judges awarding prizes for creativity and business potential. Satchel won second place in Best Presentation and first place in Greatest Business Potential. “I was pretty proud of that,” he beamed. Bear Gold is 100% pure, raw, organic and local. It starts with honey from the Pixie Honey Company. Satchel now buys it ten gallons at a time. The charming logo was his idea and design. It was great fun to talk with this young businessman. He’s smart, willing and doing things that others do only in dreams. I asked about the future, for both his personal goals and his business. Satchel plans to attend college (though he has to get through high school first) and get a double major in business and entrepreneurship. He sees Bear Gold in local stores in the foreseeable future and is excited to see how expansion fits into the picture. In the meantime he’s making more. From each sale, Stachel donates fifty cents to Thurston County’s shelter, Joint Animal Services. Satchel Sogn’s business called Bear Gold makes whipped honey. Whipped honey is not honey butter. It’s 100% honey – just in different crystal formations. It spreads more than it pours. A popular option is to eat it right off the spoon. It’s great on toast, crackers, English muffins or inside a peanut butter sandwich. Satchel noted, “It’s surprisingly good with dill pickles!” That came from experience. 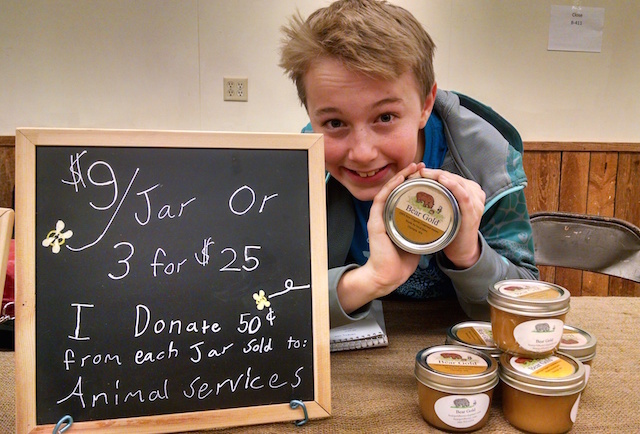 If you’d like to get your paws on a jar or two, you can contact Bear Gold online. Each 8-ounce jar costs $9 with a discount offered for buying more than three jars. Store the whipped honey in the refrigerator after opening to prevent thinning. For more information about YEE! Young Entrepreneurs Expo for 2016, please contact Kristine Sogn at sognart@gmail.com. Olympia school district students from first grade through high school can participate. There is a small fee to be in the showcase but business owners can keep all their profits. What is one lesson Satchel has learned on this journey? “Don’t take ‘no,’ too hard,” he cautioned. He’s found that being polite and friendly to customers goes a long way to building a business. “I like helping people,” he told me. Just imagine how much more experience he’ll have by the time he’s 18! Thanks, Satchel, for participating in the community in a creative, constructive and healthful way.